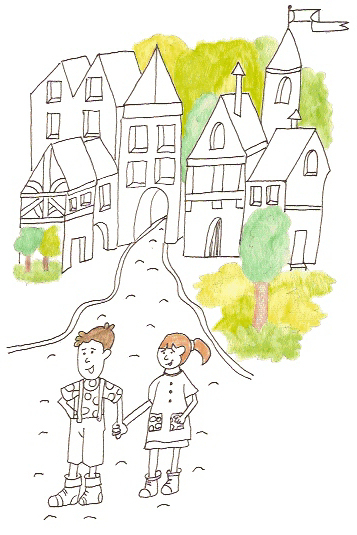 Ginger and Jon lived in a small village. The houses, each decorated with wooden timbers, had stood there since the early 1700's, when the village was founded. Many famous poets and authors had spent time living there, hoping for inspiration from the archaic buildings and ambiance radiating from each. Ginger's father, a writer, spent most of his days at the library, researching and studying about ancient times. Her mother owned an art store. Whenever a new painting came in, Ginger spent the day at the store, watching her mother frame it. Jon's father and mother owned the local bakery. Jon helped them whenever he could, by carrying bags of flour and stirring bowls of dough. Jon and Ginger were best of friends. When they weren't with their parents, they were together. An old village has many secrets and Jon and Ginger wanted to find them all. Dark alleys, winding behind centuries old pubs offered many hiding places where Jon and Ginger could watch passers by and make up stories about pirates and highwaymen and Celtic warriors. One summer morning a blue sky brought with it flocks of starlings. They landed on the library roof, and on the steeple of the Norman church and on every building in the village. Jon and Ginger heard the squawks and ran down the street. “Look, Ginger. Look at all the birds.” Jon pointed to the rooftops. “I say we hide behind the pub, so they can't eat our eyes.” Jon grabbed Ginger's hand. “Our eyes? Birds don't eat people's eyes, do they?” Ginger wasn't sure. They headed down the alley and found a comfortable spot to sit. Unfolded cardboard boxes spread out across the stone road, gave them a place to think about the birds. “I think they've come to warn us of the plague. Did you know that the Black Death killed nearly every person in this village a long time ago.” Ginger rubbed her hands together to take away the shady chill. “That doesn't mean the birds are here for that. Plague is carried by rats, not birds.” Jon scooted his knees to his chest. Just then a dozen starlings flew down from the top of the town hall, landing on the cobblestone road. Their wings spread to the side, their beaks open, they looked like they were about to attack. “Don't say a word, Jon. They might not have seen us.” Ginger put her hand on Jon's arm. The back door to the pub opened wide. Mr. Anderson tossed out leftovers from the night before. Bread soaked with congealed cream of mushroom soup, splattered across the ground. The starlings flocked over, pecking madly at the old food. Bits and pieces of pork, beef and mutton mixed with cold lima beans and peas. “That is so gross,” Ginger gagged. Jon jumped up. “I'm out of here.” He ran down the alley, away from the birds and didn't stop running until he arrived at his parent's bakery. Ginger was right behind him. “Ginger said they carried the plague.” Jon pulled away from his mother. “Don't be daft, Ginger. How silly. Why don't you go to the library and find your mum. She'll show you the history books,” Jon's mum said. Ginger nodded. She and Jon went to the library, keeping their eye on the birds. Ginger's mum pulled out several history books and read a few articles to them. Relieved, Ginger and Jon went outside. “Maybe we should play with the birds instead of being afraid of them,” Ginger said. Once again they searched for a hiding place and sat, hidden from the world. Instead of worrying about the starlings, they talked about Robin Hood and his merry men.